Now is the best time to start thinking about what you want to add to your wardrobe to bring it into Spring/Summer sizzle. 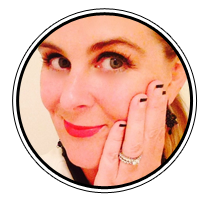 So I have partnered with some fellow fashion bloggers to bring you our personal loves from the Jag Jeans Spring catalogue to have your Jag Jeans SS17 ready to roll. PLUS we are hosting a giveaway on INSTAGRAM. Simply follow the three other bloggers — Amber of ALL THE AMBIENCE, Megan of SWEET SAUCE BLOG and McKenna Moe of THE MODERN MOSAIC and be sure to read their posts on how they styled their own Jag Jeans outfits. So here are the deets on my outfit — talk about the perfect amount of distressing in these NORA SKINNY DISTRESSED jeans* in Durango Wash / wearing size 12 / $79. 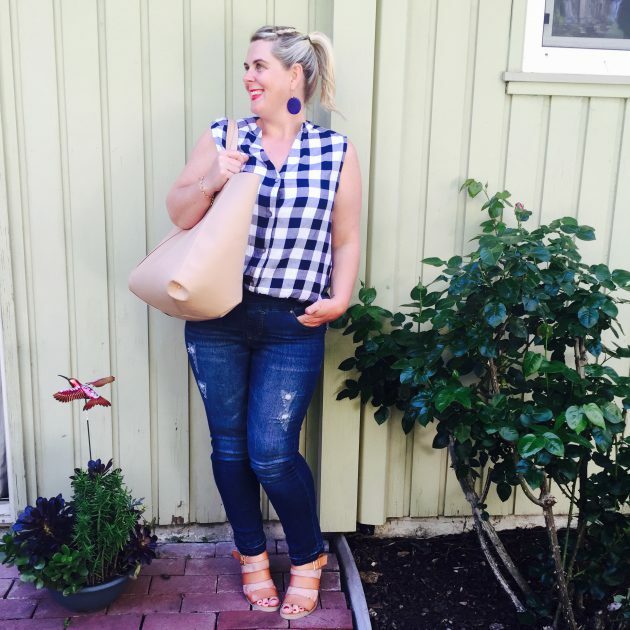 I have always been a Jag Jeans fan for how they fit my curves so perfectly. But I have also had countless reviews, direct from friends and clients, off all body types, of the lovers they are too. 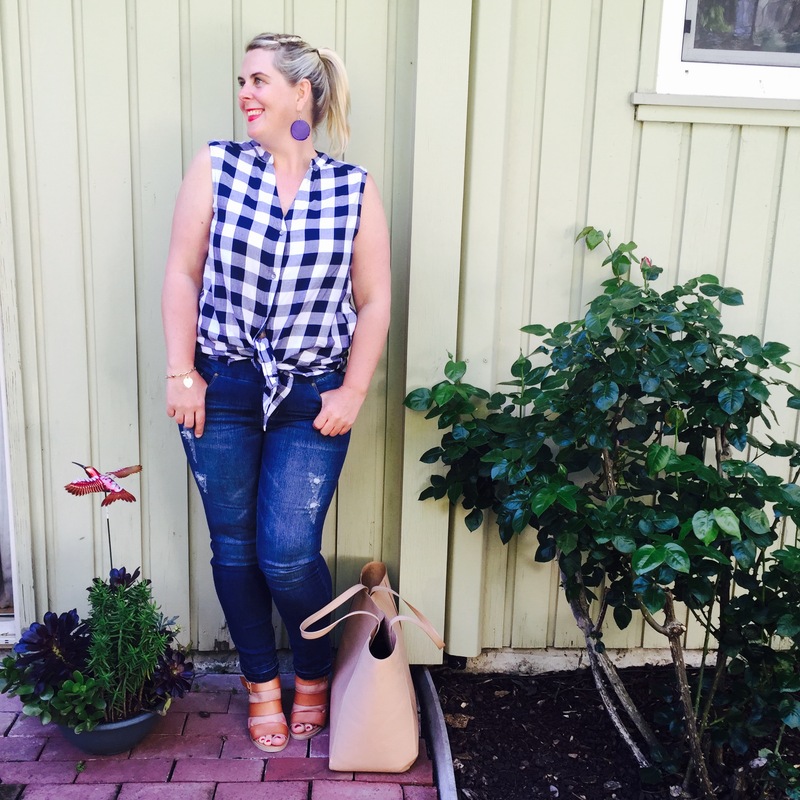 Total Jag Jeans converts. I am also wearing the ASPEN SLEEVELESS top / wearing size M / $59. Gingham takes me right back to my grungy 90’s, and is totally on trend. Navy blue is one of my fav colors for Spring and Summer. I love how this top can be worn multiple ways — open, tied at the waist, or just buttoned and long. The high low is perfect for some bootie coverage and the collarless neckline is so sleek. Look at that raw edge. Totally on trend and fabulous! DO YOU WANT TO WIN A PAIR OF JAG JEANS FOR YOURSELF? IT’S SO EASY. We’re each giving away a pair of JAG jeans. That’s FOUR WINNERS! To enter, join me on INSTAGRAM today at 4 p.m. CST, or 6 p.m. EST. 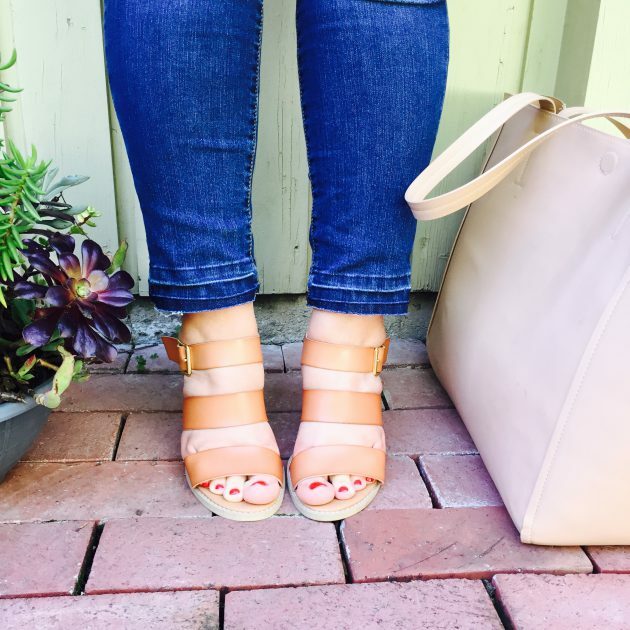 Follow the instructions to follow each blogger and JAG Jeans. Bonus points for leaving a comment and tagging a friend who could use a new pair of denim. Closes April 14 at 5 p.m CST, or 7pm EST. Check back on Friday when we announce our winners. * Jeans and top gifted for giveaway promotion.